This handy guide will help you determine when to plant your favorite herbs. It has plant height and the best time to harvest. Click here to access the guide in pdf format. We know your time is valuable so weekly, biweekly, triweekly or monthly... we can handle your regular or even one time mowing needs. It's important that your lawn is mowed properly. We use commercial mowers, keep our blades sharp, line trim edges and blow out grass clippings which leaves you with a nice pristine lawn. When we mow regularly, we are able to detect problems such as dry spots, fungus, weeds and more and take care of these issues before they wreak havoc on your lawn. We recommend aeration be done at least one time per year, preferably the Spring. 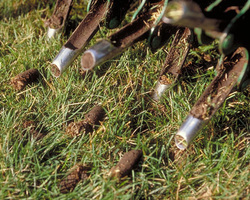 Aeration relieves soil compaction and increases water to the lawn's roots. The plugs are left on the lawn to naturally decompose and we suggest a fertilizer application be applied during the same visit to encourage strong roots and a healthy lawn. Water for about 15-20 minutes at least 2 days before we aerate so we can get a good clean plug. These services are key in Central NM. 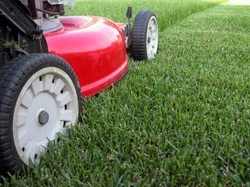 Our professionals will keep your lawn green and the yard weed free. We also apply a pre-emergent in the spring and late summer to non turf areas to help reduce the amount of weeds. In New Mexico, with our high winds and unpredictable moisture, we know that it's impossible to completely eradicate weeds, but we can sure help keep the numbers down. And whatever our applications don't take care of we can come out and manually remove. You can see in this picture how excess thatch can prevent essential water and nutrients from getting into the soil and reaching the root system. We recommend power raking your lawn in the spring at least once every two years. Power raking removes excess thatch, the dry grass that accumulates just above the dirt line. By removing the thatch we help water and nutrients reach the root level of the lawn ensuring a healthier and more beautiful landscape. This short video shows the process we use when power raking. Yard cleanups are essential to avoid pest problems, plant disease issues and even city fines. From minor leaf cleanups to major yard debris removal, QLC's hard working staff will remove all unwanted yard trash and debris leaving your yard clean and tidy. Are you trying to sell your home and need some curb appeal? We can come spruce up the yard before you have an open house. From trimming to pruning, deadheading to removal, we will keep your trees and shrubs neat and tidy. For more detailed information on Tree and Shrub trimming click here. ​We also do rose pruning in the spring and deadheading throughout the growing season. Call today for your FREE ESTIMATE on these services!